"Whatever I know, I owe solely to my assiduous reading of books of the ancients, to my desire to understand them and to appropriate this science; then I have added the observation and experience of my whole life." – Albucasis, from his book Kitab al-Tasrif. Medicine has a great many “fathers” of the trade; Hippocrates in Ancient Greece, Sushruta in Ancient India, Hua Tuo in Ancient China, Guy de Chauliac and Ambroise Paré in France, Scotsman John Hunter, American William Stewart Halsted, and many, many others in between. One of those “in-betweeners” was Abu al-Qasim al-Zahrawi, who is also known by his western moniker of “Albucasis.” He lived and worked in the Andalusia region of southern Spain from 936-1013, and like so great men and women of history, he was a product of the time and place in which he was raised. At the heart of Andalusia was the great city of Córdoba, which in the 10th century was one of the world’s most populous cities and an international center of art, science, culture, and economic growth. At a time when the rest of Europe was struggling through the Dark Ages, the Islamic Golden Age was in full bloom, and Córdoba played a major role in that success. In fact, Córdoba was larger than London and Paris combined, was lined with citrus trees along its streets, and was even one of the first cities in the world with oil streetlights. 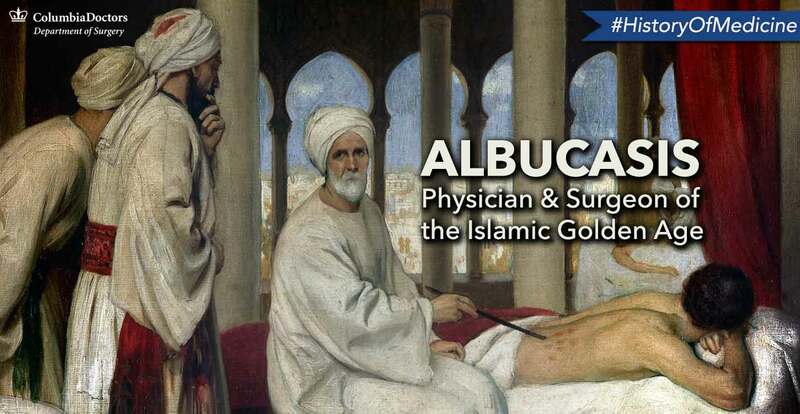 It was in this cultural milieu that the famed physician and surgeon, Albucasis, made his contributions to medicine and surgery. Albucasis was born in a nearby village a few miles from Córdoba and spent his entire life in the region. While little information exists about his early life, we know that he became the court physician to the Andalusian ruler Hakam II. While that was surely a notable position, his great legacy was his 30-volume tome on medicine and surgery, Kitab al-Tasrif. The Kitab al-Tasrif was a remarkable medical textbook replete with illustrations of surgical procedures and tools of the surgical trade, including many Albucasis had invented himself. Among those devices were new tools for examining the throat and ears, as well as a device to safely crush a kidney stone that had become lodged in the urethra. His writing provided the first written description of hemophilia, the hereditary hemorrhagic disease, as well as the first description of ectopic pregnancy. Other sections described diseases, symptoms, and treatments for nearly 300 other conditions on topics in dentistry, surgical dermatology, obstetrics and gynecology, orthopedics, pharmacology, and more. Albucasis’ Kitab al-Tasrif proved to be a critical reference for physicians and surgeons for the next 500 years and beyond. The fact that fellow “father of surgery” Guy de Chauliac quoted Albucasis over 200 times says a great deal about the staying power of his guidance and the influence he had on the great European surgeons of the Middle Ages. In the end, the great Albucasis’ insights and innovations, gleaned during over 50 years in the practice of medicine, served as a bridge between the ancient and modern and advanced the knowledge from the past into an educated foundation for the future.